Cells in a general context, can die due to several factors. It could be due to external factors such as mechanical injury or exposure to toxins. Cells can also be attacked by the immune system if they are infected or faulty. Generally, given that billions of new cells are produced daily, it is important for older ones to die in order to maintain homeostasis which is a physiological balance. There are different ways a cell can die. In this blog post, we will be covering forms of both spontaneous and programmed cell death. 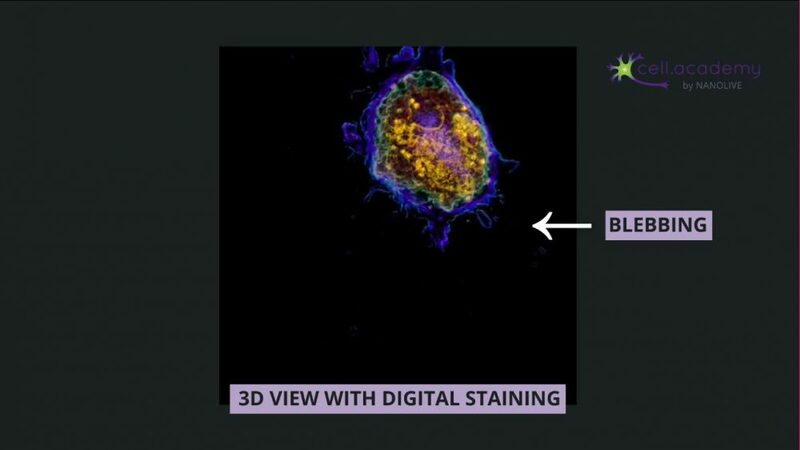 If you want to see how pathogens and cancer cells are eliminated by the immune system, you can watch the dedicated video here: https://youtu.be/qmedkNV4NVY. Generally speaking, anything that modifies the pH levels in a cell can cause irreparable damage and provokes a spontaneous cell death called Necrosis. This can also be triggered by infection, toxins, injury or heat stress. Necrosis is considered as spontaneous, because it happens suddenly in response to trauma and is basically cell murder. In image 1, a healthy mammalian cell is exposed to high concentrations of sodium hydroxide which increases the extracellular pH. This leads to osmotic perturbation which is lethal to the cell. You can see how the cell first gains in volume as the organelles swell up, which then causes a rupture of the plasma membrane, finally leading to an outflow of the intracellular contents. Sodium hydroxide is commonly found in drain cleaners, so make sure you take precautions when handling this powerful, but dangerous liquid! Along with this outburst of contents, the cell also releases danger signals through molecules which activate an immune response to antigens in and around the dying cells shown in image 2. Necrosis is therefore essential to activate a rapid immune response following trauma. This response to injury is so stereotypical that pathologists often use this information to date the time of tissue injury, in the case of a heart attack, for example. Many of our cells die at predetermined times through a programmed cell death called Apoptosis: in some cases, it’s because they are no longer needed after a certain stage of development. For example, in humans, during embryonic development, a webbing is present between our digits giving our hands and feet a “paddle” shape as seen in image 3. If you look at your hands now, this is generally not the case because this webbing is eliminated through apoptosis during the embryonic development. 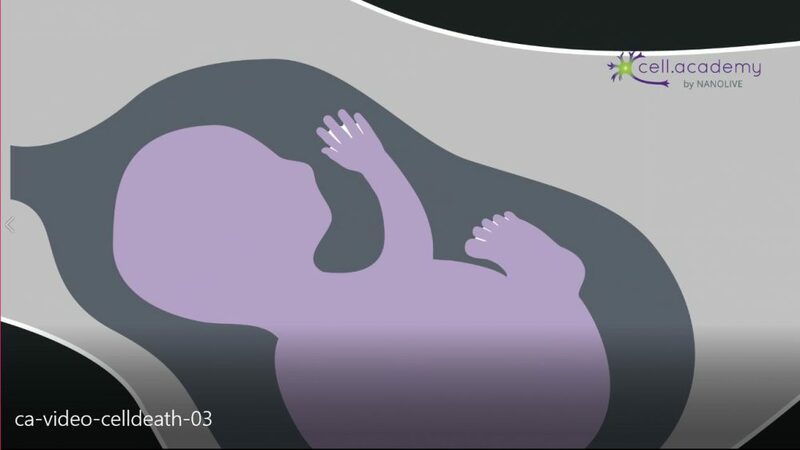 Now, you might know someone who has two fused fingers or toes, which is generally due to a lack of apoptosis during this stage and can only be corrected after birth through surgery. 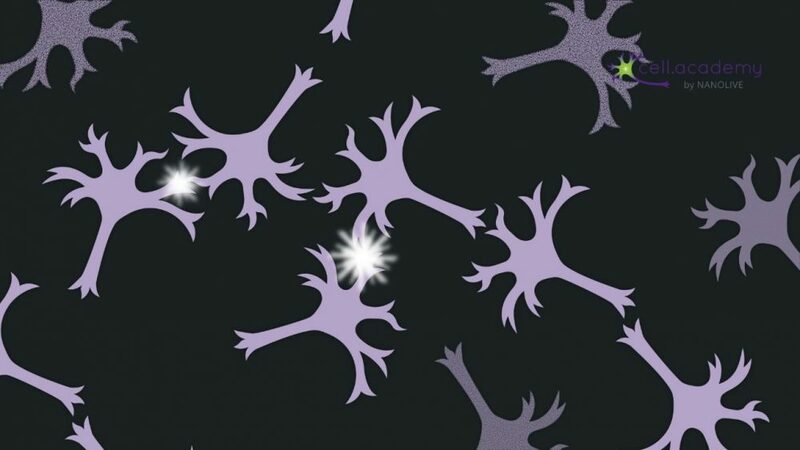 In other cases, cells are intentionally produced in excess, in order to select the most adequate ones – a good example of this is during brain development: many neurons are produced but only those that make the correct connections with other neurons are preserved – the remaining are eliminated through apoptosis (see image 4). In general, most cells have a natural “expiration date” after which they are programmed to be eliminated and replaced by new ones. Red blood cells live for about four months, while skin cells only live about two or three weeks. Egg cells and most neurons are not replaced at all once they die… don’t hit anyone on their head – their brain cells might not recover! So once a cell has reached the end of its predetermined life-time, it activates an internal pathway of apoptotic signals which leads to its own death – this could be thought of as cell suicide. 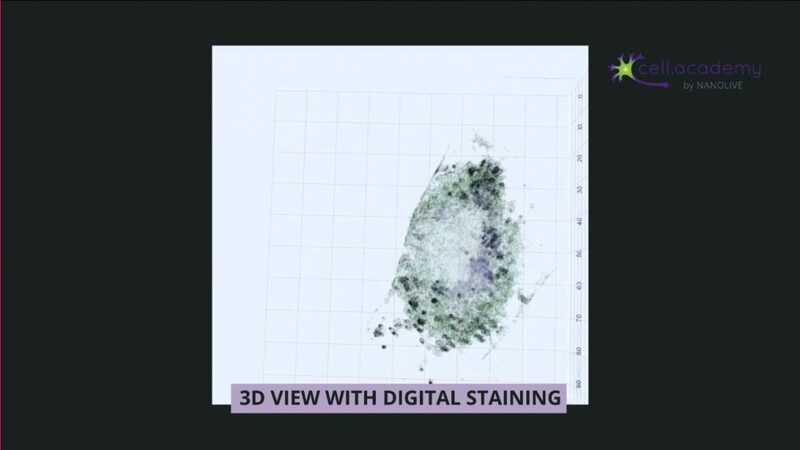 In image 5, we can observe the morphological characteristics of apoptosis: the volume of the cell reduces as the cell internally condenses its structures and fragments the DNA and organelles. This “boiling” feature of the plasma membrane called blebbing is due to the breakdown of the cytoskeleton. Finally, the cell is broken down into apoptotic bodies that phagocytic cells can engulf and remove before the contents of the cell can spill out onto surrounding cells and cause damage to them. This is a very clean death that doesn’t require an immune response, which is why we don’t realize that it’s happening! Apoptosis is very important in maintaining homeostasis since, as new cells are created, older ones need to be eliminated in order to maintain steady functions. In a tumor, it is common for the cancerous cells to block their own apoptotic pathways, which is why they keep growing and proliferating without control. 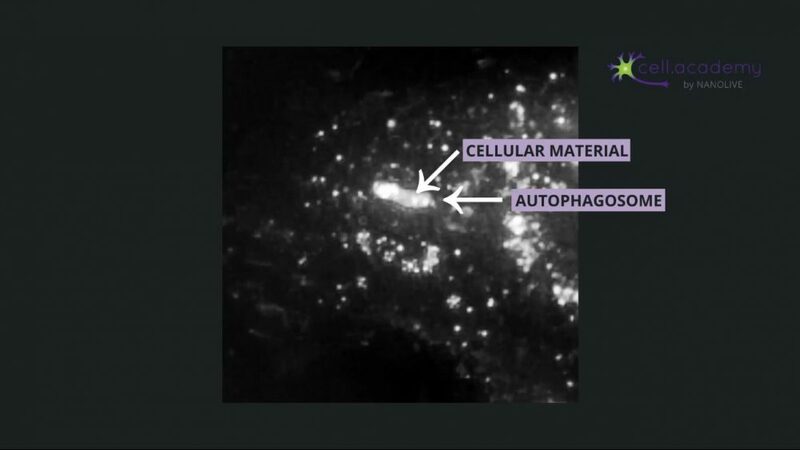 When speaking about programmed cell death, the term autophagy often comes up. It is characterized by autophagosomes (see image 6) which are double-membraned vesicles containing cellular material to be degraded. Some dying cells do present autophagosomes, hence the association of this process with cell death, however autophagy itself is a fundamental process in the adaptation to starvation and an efficient survival strategy in times of physiological stress. So rather than committing suicide, the cell degrades and recycles its inner organelles and unused proteins to maintain homeostasis and metabolic functions and ensure its survival. In image 7, you can see the vacuolization of the cytoplasm followed by heavy lysosomal activity within these autophagic cells. 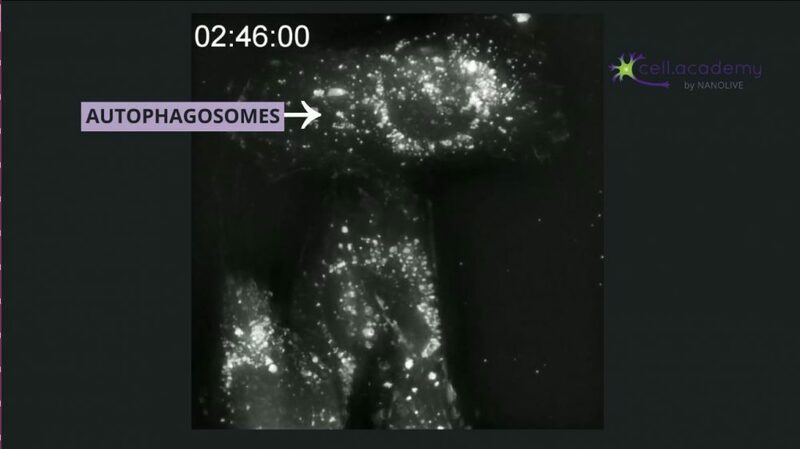 The large autophagosomes fuse with lysosomes, which degrade the organelles and proteins from the cell’s cytoplasm. Instead of killing off the entire cell, it is only replacing some cell parts. Nutrient deprivation is the key activator of autophagy, and it takes around 12 hours of fasting to initiate the process. Some studies show that cycles of fasting can reset and rejuvenate the human body, which is why fasting-diets are gaining in popularity. But it’s important to note that the scientific studies on the link between fasting and autophagy focus on its role in disease prevention and longevity, not weight loss, and this is still a field of intense research. So, as we’ve seen today, it seems ironic, but our cells need to die in order to keep us healthy! 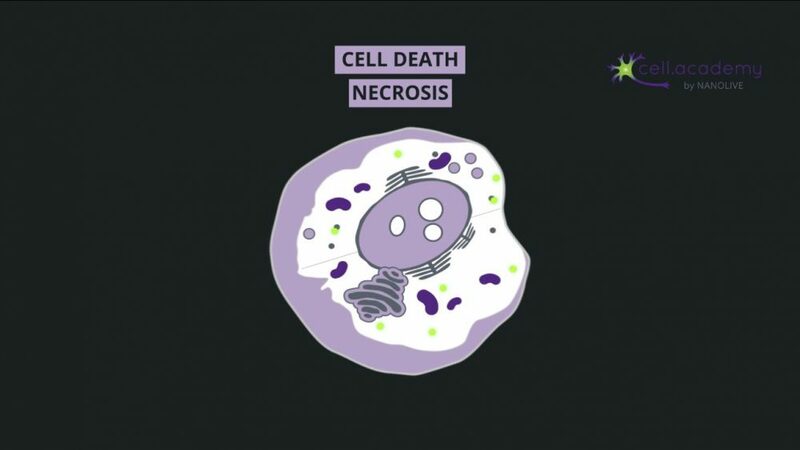 Do you know about any other types of cell death? Let me know in the comments below, and head over to cell.academy to see more videos of living cells!